Cross Hands Hall is a relatively new Cross Hands Hall is a relatively new haunting dating back to only 1904 when it served as an entertainment centre for the local area of Cross Hands near Llanelli, Wales. This is a new location that has entered the world of the paranormal due to numerous reports and sightings of black shadows moving around the projection room and the front lobby. People have been touched, clothing tugged, doors have been opened on their own, a strange mist has been seen in various parts of the building and numerous reports of poltergeist activity. 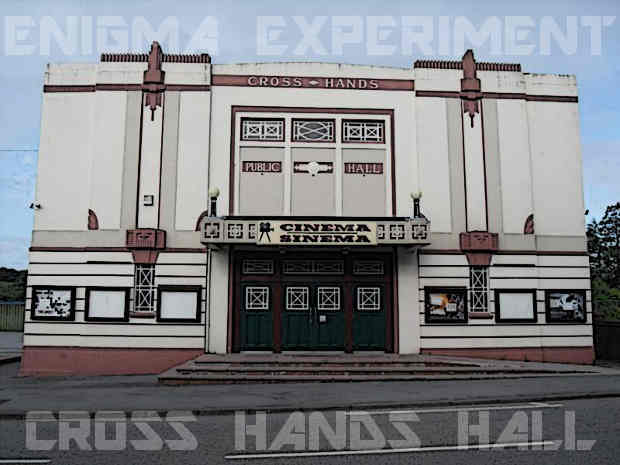 The Enigma Experiment is looking for a small team of guests to investigate this new and interesting location. Could it be the land where the building is sighted that could explain the strange occurrences or has the building experienced some kind of trauma in its sort history that may have triggered off the haunting of Cross Hands Hall? On the night we will be conducting various experiments and vigils throughout the evening to try to get to the bottom of whom or indeed what haunts the hall and cinema... This is the first time The Enigma Experiment has visited this location and it should prove to be an interesting night!